This update covers developments on the freedoms of association, peaceful assembly and expression in Kazakhstan from March to June 2018. International Partnership for Human Rights (IPHR) and Kazakhstan International Bureau of Human Rights and Rule of Law (KIBHR) prepared it for the CIVICUS Monitor based on KIBHR’s monitoring of the situation in the country. The situation regarding fundamental freedoms in Kazakhstan has deteriorated steadily over the last few months. As reported previously in the Monitor, draft legislation was under consideration that would introduce new restrictions on religious practice and religious communities. This draft law has been widely criticised at home and abroad for containing provisions which violate freedom of religion in Kazakhstan. The draft bill, which passed the initial hearings in the Majilis (Parliament) in May 2018, aims to introduce legislation banning certain head coverings and increasingly systematised control of “radical” religious associations. Further, the religious trends the authorities are concerned about are vaguely defined in the proposed draft law as “a set of religious views, ideas, and doctrines that threaten the protected human rights and freedoms aimed at weakening and (or) destroying moral foundations, spiritual and cultural values.” If adopted, the draft law risks moving Kazakhstan towards policies that will disproportionately affect Muslims and certain religious minorities. Besides the proposed draft bill, there have been numerous serious incidents targeting the freedoms of association, peaceful assembly and expression. As usual, many of the alleged offences attributed to activists, media and journalists by the Kazakhstani authorities, are rooted in the Article 174 of the Kazakh Criminal Code: Incitement to discord, which with its over-broad formulation of offences has become the normative way of the authorities to target critics. Besides Article 174, the authorities have used legal restrictions on freedom of assembly in Kazakhstan, to target people gathering in so-called “unsanctioned meetings”, and also legitimised the use of force when detaining demonstrators, including children and elderly people, as well as unrelated bystanders. Law enforcement officials dispersed and detained people who had peacefully gathered , at times with the use of force. Various media outlets were targeted by the authorities in the last three months. On 30th March, the Ratel.kz news site was blocked in Kazakhstan. A few days later, on 2nd April, the editorial offices of Forbes Kazakhstan and Ratel.kz were searched by police and documents and computers were confiscated. On the same day, the homes of several journalists, editors, and affiliated people were also searched by the authorities. These included Ratel.kz editor-in-chief Marat Asipov, as well as journalists Sapa Mekebaev and Anna Kalashnikova, along with the widow of the recently deceased journalist Gennady Benditsky. The deputy editor of Forbes Kazakhstan, Alexandra Vorotilova, was detained, and Marat Asipov and Sapa Mekebaev were released after a short interrogation. The police actions were reportedly triggered by a request from Zeinulla Kakimzhanov, a businessman and former Minister of Finance, who previously had filed a lawsuit together with his son and business partner Ilkhalid, claiming that the media had knowingly spread false information, which had damaged the reputation of him and his son. The information was related to a series of news articles on alleged corrupted business schemes. On 4th April, Medeu District Court in Almaty fined the two media outlets a total of 50 200 000 KZT (around 146 000 USD) in favour of the Khakimzhanov family. Despite not agreeing with the decision, the two media outlets paid the fine. On 28th May, Medeu District Court in Almaty ordered the closure of website Ratel.kz (along with the site balborsyk.kz, which was also used for publishing news from Ratel.kz). The registration of the media outlet was cancelled, and the usage of the Ratel name, including modified duplicates of the name, was banned. Ratel.kz was also forbidden to use Facebook as a platform for disseminating news. In addition to the fines imposed related to the alleged libel of the Khakimzhanov family, the Prosecutor also noted that Ratel.kz had not renewed its domain registration, which was still registered under the name of deceased Gennady Benditsky. Ratel.kz was also criticised as although it was registered for publishing materials in Russian it was also publishing materials in Kazakh and English. A similar incident occurred in Pavlodar with a journalist connected to Ratel.kz. In February 2018, journalist Jamila Maricheva had two consecutive articles published on Ratel.kz related to Assel Aidasheva, the wife of a local official, who had travelled to Europe. Maricheva had used data from Aidasheva’s public account on social media to publish information on Assel Aidasheva’s travels. Despite this, Assel Aidasheva filed a lawsuit against Jamila Maricheva, who in mid-April was ordered to pay a fine of over 200 000 KZT (around 580 USD) for “moral damages” inflicted on Assel Aidasheva as a violation of her right to privacy. Following the incident, Assel Aidasheva’s husband told the media that he and his wife do not travel abroad. In an ongoing case, Shymkent-based blogger Ardak Ashim was forcibly incarcerated in a psychiatric facility for one month. The conclusions of the so-called “forensic examination” stated that Ardak Ashim had been “suffering from a prolonged mental disorder since 2015”. As previously reported , Ardak Ashim was detained on 15th March after her home had been searched by the authorities, on charges of “inciting social discord”, (the notorious Article 174 of the Kazakh Criminal Code). Police officers also questioned Ashim on alleged connections with the banned Democratic Choice of Kazakhstan (DVK – from the Russian abbreviation) movement. On 31st March, Ashim was again taken for interrogation by the police, and she was subsequently sent to the psychiatric facility. The authorities also claimed that in 2004, Ashim had been treated in a hospital for a “post-concussion syndrome”, something relatives of the blogger deny. On the evening of 5th May Ashim was released from the psychiatric mental facility. On 10th May, the Abai District Court in Shymkent ruled to exempt her from responsibility of “inciting social discord”, as she was in a “state of insanity” while she committed the alleged crime, and the judge demanded further psychiatric treatment. Ardak Ashim’s forced one month stay in a psychiatric facility was met by international criticism. The authorities actively tightened restrictions on freedom of the internet. In the beginning of April, the Minister of Information and Communication Dauren Abaev threatened to block access to the popular Telegram messaging app, unless Telegram agreed to delete material shared on the Telegram channel of the banned DVK movement. For several weeks,internet users in Kazakhstan had been experiencing periodical lack of access to different internet sites and apps, usually lasting for several hours. The outage often coincided with live video streaming or communication from the exiled politician and businessman Mukhtar Ablyazov. Between 12th to 13th June, some users reported that the internet began to be disrupted within Kazakhstan, namely for services from the state internet provider KazakhTelekom. It has also been reported that a number of websites have become inaccessible in Kazakhstan, including the encrypted ProtonMail. In Uralsk, on 19th April, police opened an investigation against the media outlet “Uralsk Week” related to its YouTube channel. The investigation concerned a video highlighting issues related to a harmful gas odour affecting the health of residents in the village of Sulukol. Below the video, one commentator had posted a call for a rally related to DVK. The comment was later deleted. The publisher of Uralsk Week, Tamara Islyamova, editor Lukpan Akhmedyarov, as well as journalists Raul Uporov and Maria Mednikova were subsequently interrogated, along with RFE/RL correspondent Sanat Urnaliev. Following the interrogations, all received an official warning about participating in DVK activities. Freedom of association in Kazakhstan has lately been negatively impacted by the tense situation caused by the banning of the DVK movement and the targeting of its alleged supporters by the authorities. As covered previously the DVK movement was banned on 13th March after a Court in Astana labelled it an extremist organisation. Following this ruling, spreading and producing material about the DVK in the mass media, telecommunication, social networks, messages channels and video hosting sites, became a criminal offence. One of the main outlets of information from DVK came from a Telegram channel, which had around 100 000 subscribers by the end of March. The authorities were so concerned of the Telegram channel, that they published a warning on the state-funded news site nur.kz, encouraging people to leave the DVK Telegram channel, in the case they had been added to the group. From mid-March, the authorities began to actively seek out activists, bloggers and others, who were thought to sympathize with DVK, using information from subscribers to the Telegram-channel of DVK. Several people received administrative warnings about their alleged affiliation with DVK. The Kazakh authorities also targeted alleged DVK supporters outside the country. The well-known blogger Marat Tungishbaev, who had been living in exile in Ukraine and Kyrgyzstan for several years, was arrested on the 10th May in Bishkek by the Kyrgyz security services (GKNB), and the Kazakh authorities subsequently sought his extradition. On 26th June, Tungishbaev was handed over to the Kazakh authorities. He is accused of spreading illegal information on DVK on Telegram and online social networks. Tungishbaev is currently incarcerated in a pre-trial detention facility in Kazakhstan. Throughout May and June, there were several attempts by people to hold rallies, which were successfully hampered by the Kazakh authorities. 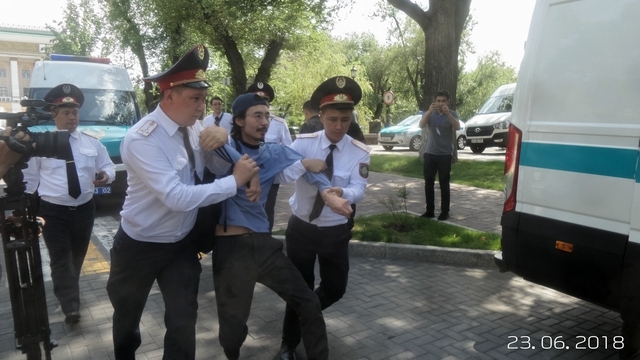 On 10th May in Almaty and Astana, police dispersed people attempting to gather at anti-torture demonstrations called for by DVK, with the slogans “Stop torture!” and “Freedom for political prisoners!”. The demonstrations were timed to occur during an EU Parliament delegation visit to Astana. In Almaty, around 80 people gathered near the Opera, with around 100 bystanders. Special forces officers and police detained about 70 people, including children and elderly people. Ten people were charged with participating in an unsanctioned gathering, and eight of them were held in detention for several days. In Astana, around 60 people gathered in the area of Kosmonavtov Street, where most of diplomatic community are located. Most of the 60 people gathered were detained by police officers using force, and random bystanders and passersby were also arbitrarily detained. The police used excessive force to disperse the protesters. At least six people were charged with participating in an unsanctioned gathering, and four people were arrested for between three to ten days. There were also gatherings in Aqtobe, Semey, Shymkent and Uralsk. In Aqtobe, police detained 14 people. In Shymkent and Semey around 20 people were prosecuted for an illegal gathering, and were fined and held for a few days. A week later, on 17th May in Astana, activists Maksat Ilyasuly and Raushan Torbaev were held under administrative arrest for five days. This happened after they filed a request for permission to hold a demonstration on 21st May, the second anniversary of the country-wide land reform protests of 2016. The two activists never received an official denial of their request. On 21st May, officers of the special forces in Astana detained a person attempting to hold a one-man protest, holding a sign bearing the text “No sale of land”. On the same day, 74-year-old pensioner Ibragim Kozybaev was arrested after holding a one-man protest outside the House of Journalists in Astana. Around ten special force officials detained the elderly man. In Shymkent, Ibragim Alserke and Zharkynbek Seitinbek were taken to the police station, accused of attempting to conduct an illegal gathering and spreading information about an illegal demonstration. The two activists had previously filed a request to hold a demonstration, but were denied. Ibragim Alserke was placed under administrative arrest for 15 days. Other detainees received administrative warnings. On the 31st May, in Uralsk, on the day of commemoration of political prisoners, former policeman Albek Yergaziev protested against the decision to dismiss him from his job. Albek Yergaziev unfolded a poster with the text “Ruling by law is the characteristics of the power, not a sign of justice”. Shortly afterwards Yergaziev was taken away by two people in civilian clothing. On the same day, police in Uralsk detained three pensioners who wanted to lay flowers at the memorial for the victims of political repression. Seventy-nine-year-old Maiya Lukyanova was detained, along with two other pensioners. After being held for several hours by the police, the pensioners were released. However, on 4th July, two of them were detained for five to seven days’ for participating in an unsanctioned gathering. 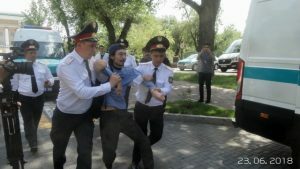 Another wave of attempted protests and subsequent arrests occurred on 23rd June in Almaty, Astana, Shymkent and Uralsk. Rallies in support of free education called for by the banned DVK movement were dispersed by the authorities. Journalists in several cities were also detained along with the protesters. The police used force to disperse and detain the protesters, which included pregnant women, children, and elderly people. In Almaty, police detained more than 60 people on Panfilov street and took the detainees to different police stations. Among the detainees was Andrey Sviridov from KIBHR. In Astana, policemen detained around thirty people demonstrating close to the city administration building. In Shymkent, the police detained tens of people on the Tauke-khan square, close to the city administration’s headquarters, and all detainees were taken to the police station where they were forced to give written explanations before being released some three to four hours later. Many of the detained were elderly people and minors. In Uralsk, several journalists were detained and taken for interrogation by the police in the morning of 23rd June, depriving them of the possibility of covering gatherings in the city at the time. Among the journalists taken for interrogation were Uralsk Week correspondents Nana Iksanova, Maria Melnikova, Liudmila Kalashnikova, publisher of Uralsk Week Lukpan Akhmedyarov, and RFE/RL correspondent Sanat Urnaliev. However, no one in Uralsk made an attempt to gather that day.